Bluehole Studio promises there'll be no level cap or content restrictions for the free version of TERA. In a move that probably isn't going to surprise too many people, TERA, the Korean fantasy MMO developed by Bluehole Studio, has become the latest in a series of titles to offer an alternative free-to-play mode alongside its regular paid subscriptions. Starting in February, TERA players will be able to switch their account over to a free-to-play version of the game called TERA: Rising. The free version won't have any content restrictions or a level cap, and will feature a new in-game store with character customization options and in-game consumables. Players who decide to stick with a paid subscription can look forward to extra dungeon rewards, bonus quests, store discounts and multiple other extras for $14.99 USD per month. More details can be found at TERA's website. 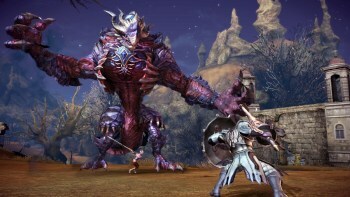 TERA originally launched in South Korea way back in January of 2011, but made its way to Europe and North America in May of 2012 through a publishing deal with En Masse Entertainment and Game Forge. The game itself received decent reviews, and our own John Funk described the game as "a breath of fresh air" for the MMO genre despite having some issues with repetitive quests.